It’s finally cooling off here in California and that means I am cooking up lots of soups and one of my favorite winter comfort foods, chili, the classic kind. This is the good stuff, heavy on meat and beans, light on veggies. That’s how I like my chili. What better way to warm up at the end of a cold day then a big bowl of chili? This recipe really is perfect, it’s not too spicy, not too mild, it’s just right. Something Goldilocks would love, probably Momma, Daddy, and baby bear too. This recipe does take a couple of hours to cook but that’s what makes it so good. 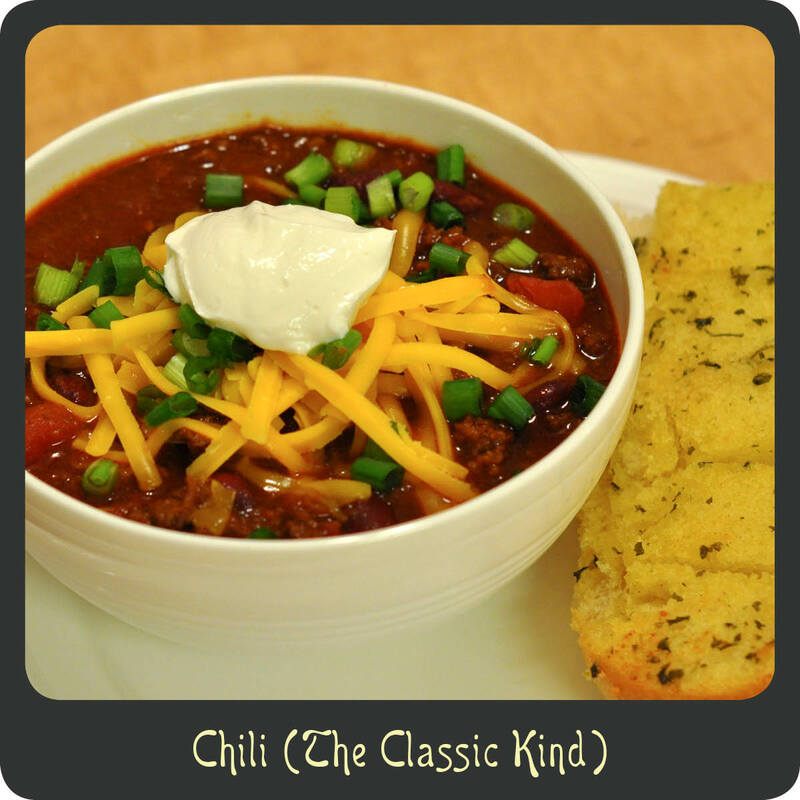 All those flavors get cooked into the meat giving you a really hearty and flavorful chili you are sure to enjoy. Note: If you are someone that likes chili with a little more kick, just add in a couple dashes of cayenne pepper. In a large pot cook the beef, onions, and garlic over medium-high heat until no longer pink. Drain off most of the fat leaving about 2 tbsp in the bottom. Stir into the pot the chili powder, flour, oregano, cumin, sugar, and salt. Reduce heat to low, cover, and cook for 1 hour stirring every 15 minutes. Add the tomatoes, beans, sauce, and 1 cup of the broth to the pot. Cook for an additional 45–60 minutes stirring occasionally. Add more broth if you want a soupier chili. Ladle the chili into a bowl and have fun garnishing it with your favorite toppings.